Civil unrest is exploding. The biggest and most violent protest in Germany erupted in Berlin over the weekend, exactly with our models calling for an explosion in civil unrest. Some 1800 police were called in and at least 120 policemen were injured in what became a street battle. 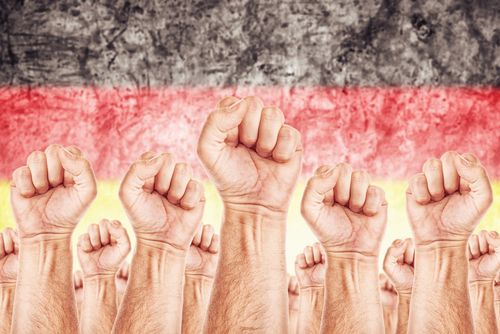 This has been the most aggressive and violent protest in Germany in the past five years. Protesters were throwing bottles, cobblestones, and fireworks, and they destroyed cars in addition to attacking police officers. It appears at least 3,500 rioters took part in the uprising. The protest is against police operations and mostly involves young people who have risen up against the police operations in the Riga street area. Protesters wore black hoods and carried banners with slogans like “Riga defend 94” and “Housing solidarity against state terror.” The demonstration went on with the crowd chanting repeatedly: “Bullenschweine get out of Riga!” Demonstrators threw firecrackers and police fired back with tear gas. The police also called in air support, employed helicopters, and called in for reinforcements from Bavaria, Brandenburg, Lower Saxony, Saxony, Saxony-Anhalt, Thuringia, and the Federal Police. Interior Senator Frank Henkel (CDU) announced after the demonstration that the police will now be present at night in an attempt to stop riots and arson attacks.